I've been locked away in that tower on the top right of this scene working diligently on finishing up this painting before fall is over. Seriously, I do wish I had this round studio room to paint in, but mine is just a cramped little spare room in our house on the second floor. 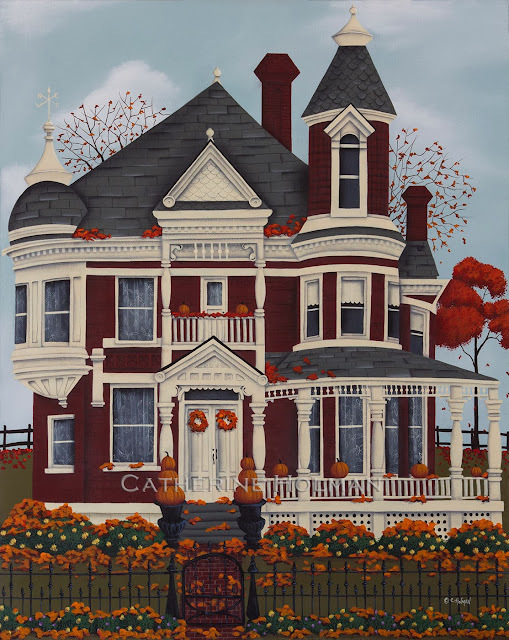 In the spirit of Thanksgiving though, I am very thankful to even have a room that I can shut myself in where I can dream of quaint little villages where people have the time to stack pumpkins in massive iron urns and line up little pumpkins on their porch railing. The Lord provides the rest of the decorations. This is a place where people truly are thankful for their many blessings. Uncle John and Aunt Dottie, as they are know to all in their little village, have been inviting folks to their home for Thanksgiving for longer than anyone can remember. They share their home, a turkey dinner, and their blessings with those who have no where else to go on this day. Family and friends help to make this a day that they will not soon forget. Gosto muito dos seus trabalhos!!!!!!!!!!!!!!!!! It's beautiful! It makes me happy to know we have such a special holiday to look forward to! Happy weekend my friend! Oh I'd like to visit there! I'd be snooping about in that turret room if no one would notice. Beautiful Victorian, perhaps Queen Anne home! It must have been fun to paint!